The bound volume in the Bodleian comprises 44 leaves, of which seven relate to Jamieson’s rather than Boswell’s dictionary, being the printed Prospectus of 1802, plus a later (manuscript ) title page and endpapers. The remaining 37 leaves constitute Boswell’s draft dictionary materials. These include Boswell’s own title page, now separated from the rest of his manuscript by Jamieson’s Prospectus, and a short bibliography of reference books which Boswell planned to use. 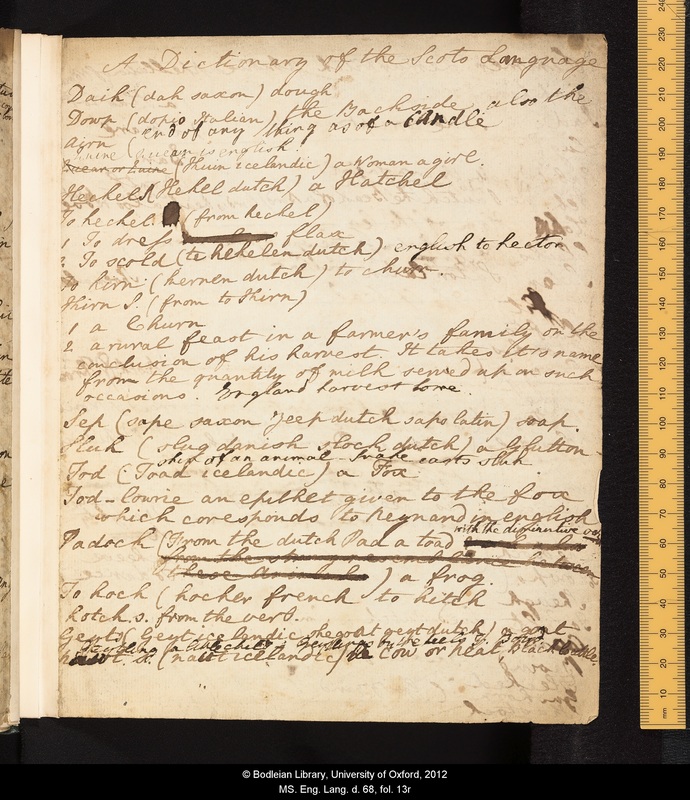 The main part of the manuscript comprises Boswell’s ‘specimen’ dictionary (55 sample entries), together with his rougher draft of around 800 skeleton entries. Most of the latter contain headwords and rough definitions, but some also have illustrative examples, suggested etymologies, or spelling variants. There is some repetition, with headwords being repeated more than once in the draft section, and there are signs that Boswell went back to the manuscript a number of times to add more information. Neither the specimen nor the draft is in alphabetical order; sometimes words are listed thematically – as for example a cluster of Scots words for seaweed. On one leaf, however, Boswell has listed words and phrases together under the letter K. In addition, there are a couple of leaves of citations excerpted from George Lockhart’s Memoirs (1714), a list of Scots phrases, and some short notes on etymology and pronunciation.